85 / 1. Pileus smooth, dry, silvery [sic] green- somewhat / uneven + fibrillous firm, becoming dry + shriveled / 2. Gills close, narrow, white heterophyllous, slightly / decurrent turning dingy yellowish white with age. / 3. Spores white / 4. Stem, stuffed, tapering above, white shiny / Growing among fallen leaves- in light soil by / path / Buck Hill Falls July 26- 1920 . / Penn. / Clitocybe virens. 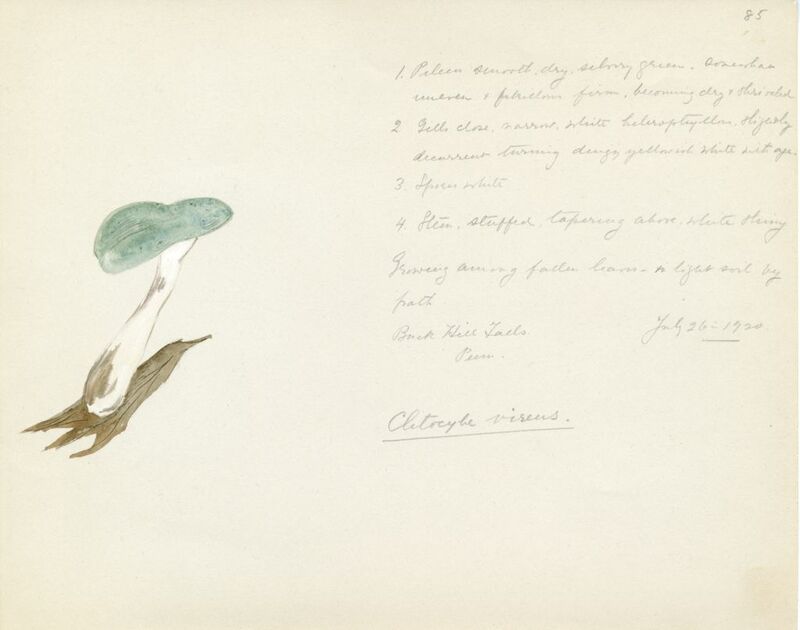 Delafield, Violetta White (botanist, mycologist, and garden designer, 1875-1949) and Culture: American, “Clitocybe virens,” Stevenson Library Digital Collections, accessed April 20, 2019, http://omekalib.bard.edu/items/show/2587.